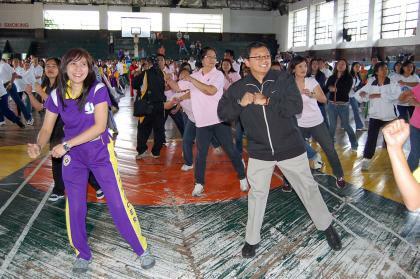 Hataw and CARE Palaro - Mayor Reinaldo Bautista Jr. does body moves during a warming up dancercise as part of the Cordillera Association of Regional Executives family day and fun games recently held at the PFVR Hall. Also shown with the mayor is Fire/Sr. Supt. Sofia Mendoza of BFP and Dir. Carmelita C. Usman of DTI. Art Tibaldo.